Six severed arms are discovered buried in a forest clearing. They are arranged in a mysterious circle, and appear to belong to missing girls between the ages of eight and thirteen. But the rest of the bodies are nowhere to be found. Criminologist Goran Gavila is given the case. A disheveled, instinctively rebellious man, he is forced to work with young female police officer Mila Vasquez. Lithe, boyish, answering to no one, Mila has a reputation as a specialist in missing children. She also has a tragic history of her own that has left her damaged, unable to feel or to relate to others. Thrillers were all I used to read when I was younger, before my obsession with Chick Lit began. I devoured the likes of Stephen King, Patricia Cornwall, James Patterson and Jeffrey Deaver and when the television shows like Criminal Minds and Dexter began I was in heaven. 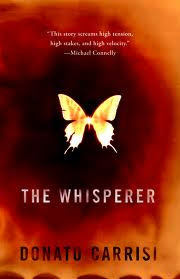 So I thought I would branch out and try another thriller after so long and had hoped The Whisperer would live up to the hype, but sadly it took me forever to get into this novel and in the end it fell completely flat for me. This novel was quite disjointed. The first half had barely any action and I struggled to keep reading. There was no flow and I kept getting distracted and would find myself staring off into space on the subway instead of reading - a rare occurrence for me, even with the abundant people watching. The narration kept flipping around and at times I had difficulty determining who was speaking and had to go back to figure it out. Even in the second half when things got a little more active, I still couldn't find myself drawn into the characters or even much of the story. I didn't find it that gruesome. I've read much worse. I kind of wish the story was told from Mila's perspective throughout. I think it would have dawn me into the story more, made me more sympathetic to her character and drawn me into the book further. One final complaint - especially with this being a thriller - was that as I kept reading and had 12 pages left (I kept looking down to see how far I had left to go - never a good sign) the book suddenly wrapped up and left me hanging, with what I thought was twelve pages remaining. This left me completely unprepared for the ending to come so swiftly with the author's notes comments and thank you's taking up the final pages. There were a few things that surprised me, but not enough to blow me over and convert this into an incredible read. There are rave reviews out there though, so let me know if you are a thriller fan and enjoyed this one. I'm curious to know! Thank you to Little, Brown and Company for our review copy. All opinions are our own.